Cholera is not only linked to climate change, it also has an El Niño angle. For instance, Papua New Guinea, an island state in the Pacific Ocean, recorded its first cholera cases in 50 years in 2009, which also happens to be an El Niño year. The periodic flow of warm sea water across the surface of the central and eastern Pacific Ocean, called El Niño, can lead to higher atmospheric temperatures and heavy rains. When these conditions are coupled with the rise in temperature and heavy rainfalls caused by climate change, ideal conditions are created for the bacterium that causes cholera to multiply, bringing about a global resurgence of the disease. 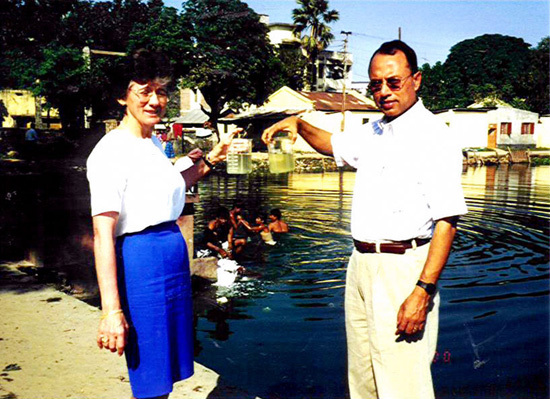 The Intergovernmental Panel for Climate Change (IPCC), an authoritative global scientific body, cited research in Bangladesh, led by distinguished US scientist Rita Colwell in the late 1990s, which established the link between the cholera bacterium, sea surface temperature and phytoplankton, microscopic plant-like organisms that live in the ocean. Warmer surface temperatures increase the abundance of phytoplankton, which supports a large population of zooplankton - animal-like micro-organisms - which serves as a reservoir for cholera bacteria, a waterborne disease. Colwell and her colleagues also traced the source of the cholera bacterium to the plankton in rivers and estuaries. A World Health Organization (WHO) study found that during the 1997-98 El Niño, a rise in sea surface temperature coupled with excessive flooding emerged as two significant factors in cholera epidemics in Bangladesh, Djibouti, Somalia, Kenya, Tanzania, and Mozambique. Most of the research into the links between climate change and cholera has been conducted in Asia, but Africa now accounts for a majority of the world's cases. The France-based Laboratoire de Génétique et Evolution des Maladies Infectieuses (GEMI), which analyzed data on cholera covering 20 years from five West African countries - Togo, Ivory Coast, Ghana, Benin and Nigeria - obtained results, published in 2007, that were similar to the findings of the Bangladesh study by Colwell and her colleagues. Colwell told IRIN by email that they were investigating cholera epidemics in East Africa, especially Mozambique, which has an Indian Ocean coastline. Between 1992 and 2004 Mozambique recorded one-third to one-fifth of all cases reported in Africa, and in early 2009 - an El Niño year - experienced one of its worst cholera outbreaks in a long time. "My hypothesis, which we are in the process of testing, is that climate changes (sea surface temperature, sea surface height, rainfall, etc.) have influenced the cholera epidemics in East Africa, notably Mozambique," Colwell wrote. Zimbabwe, a landlocked country bordering Mozambique in southern Africa, recorded one of the world's worst cholera outbreaks in 2008, with more than 4,000 deaths. The "tragic deterioration in the water purification and delivery in Zimbabwe", as a result of the economic implosion and political crisis, were among the main drivers of the epidemic, which could have been prevented, said Colwell. "Nevertheless, there are some climate changes that may well play a role in the Zimbabwe epidemic." The IPCC cited studies on the incidence of cholera in lakes Tanganyika and Victoria in East Africa and commented: "It is likely that warming in these African lakes may cause conditions that increase the risk of cholera transmission. This is an area that urgently requires research." Jane Olwoch, a senior environmental science lecturer at the University of Pretoria, South Africa, pointed out that besides the biological factors, "Floods caused by heavy rains can contaminate drinking water with the bacterium; in droughts, the bacterium can grow more easily in stagnating water in ponds and rivers." Researchers in Africa, led by Miguel Ángel Luque Fernández from the Institute of Health Carlos III, based in Madrid, Spain, were the first to show a link between higher temperature and rainfall and the incidence of cholera in Zambia in a study published in the Transactions of the Royal Society of Tropical Medicine and Hygiene, in the UK. Cholera outbreaks between 2003 and 2006 in Zambia showed that a one-degree Celsius rise in temperature six weeks before an outbreak began allowed the bacteria to multiply in enhanced conditions, leading to almost 5 percent more cholera cases, while a 50mm increase in rainfall three weeks ahead of an outbreak pushed up the number of cases by more than 2 percent. A study in South Africa's coastal province of KwaZulu-Natal in 2008, by researchers from the Environmental Change Institute at the UK-based Oxford University Centre for the Environment, found a similar link between warmer sea water, floods, and cholera outbreaks. "We know there is an indisputable link between cholera and poverty, poor sanitation, quality of drinking water, but there are biological agents involved in cholera that react to changes in climate," Olwoch said. "We cannot therefore think that we can solve the cholera problem by ignoring these factors, especially now, when we know very well that our climate is changing."